NEW - A post "Installation of SALOME 5.1.3 on Ubuntu 10.04 (64 bit)" was recently published and recommended if you have already updated to Ubuntu 10.04. I recently upgraded my Ubuntu 9.04 to the latest 9.10 x86_64 version. In this post I use Kubuntu 9.10 64 bit platform for example to share ideas on some problems you might also encounter when trying to install SALOME 5.1.2. These solutions are compatible with SALOME 5.1.3 and Ubuntu 9.10 as well. 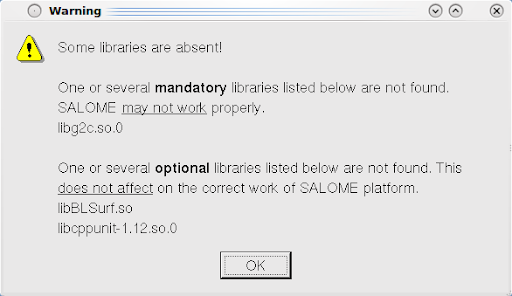 You are recommended to read the basic instructions on how to install SALOME on Ubuntu from "Installation of SALOME 5.1.1 on Ubuntu 9.04", because this post follows that one and only involves the newly fixed problems on 9.10. This time I didn't compile Code_Saturne before installing SALOME, and I therefore encountered errors complaining the system lacks g++ compiler, since it is impossible to install SWIG from binaries and it has to be built from sources. When compiling Code_Saturne, don't need to install the package again. The reason for this error is because the tar (version 1.22-1) in Ubuntu 9.10 includes a regression. This problem has already been corrected in versions 1.22-1.1 and later, which however are currently not part of Ubuntu 9.10. In order to solve this, the newer version deb package for proper architecture can be downloaded from Launchpad and installed. For example, I installed tar_1.22-2_amd64.deb and fixed the error. After fixed the last two errors, although the installation was completed, a warning dialog popped out, saying a mandatory library "libg2c.so.0" was not found. Actually this library file is essential to the mesh module, and if it is absent, the successfully installed mesh module cannot even be initialised. libg2c is a Fortran/C library. Within previous versions of (K)Ubuntu, it could simply be installed via apt-get (apt-get install libg2c0), but 9.10 does not have this package anymore (or at the moment). By searching the package, libg2c0 can be found and downloaded. 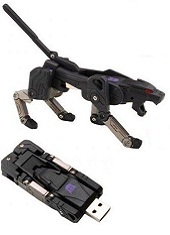 It is worth noting that the package depends on gcc-3.4-base, which is, of course, outdated. Then ignore the dependency, in another word, force to install the package libg2c0. Now the mesh module could then function. related to libg2c0: I forced to install the package as described, but now I can't install anything else because of a broken dependencies problem with aptitude. Is there any way to ignore this dependency or any way around? I noticed this problem recently. libg2c0 depends on the package gcc-3.4-base, which can also be found via the link of libg2c0 given above. In 9.04 the dependency can be solved automatically, and in 9.10, however, you probably have to install them manually. I hope your respondence and will update this post later to include this. Many thanks and happy to communicate.